Baking Soda or Sodium Bicarbonate is one of the most versatile ingredients in your kitchen. Baking soda is great for making homemade cookies, but did you know you can also use it in rooms other than the kitchen? This versatile ingredient has so many amazing uses, you’ll find a way to use it just about any room of your house. 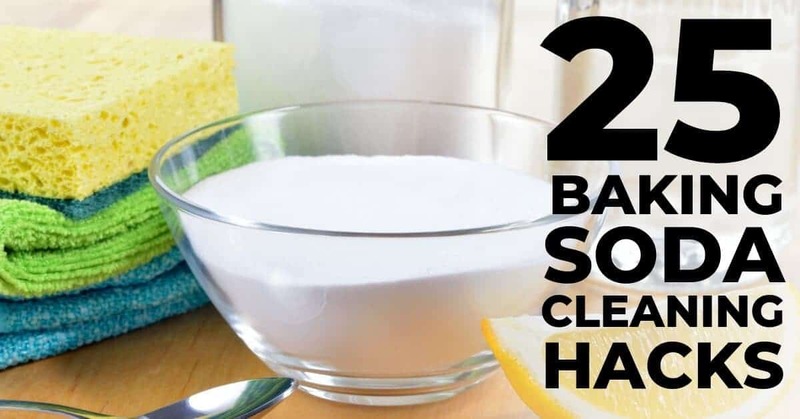 So having a box of baking soda at home is extremely useful and can make your cleaning chores very easy to accomplish. Here are 25 awesome baking soda hacks for your home. Baking soda will soften your clothing without the need for the harsh chemicals found in most fabric softeners. Just add a sprinkle of baking soda to your laundry to naturally soften your clothes and neutralize odors as you wash. Baked on food and grime is difficult to remove from pots and pans, especially if you’re worried about damaging enamel or copper pots. Baking soda works as a scrubbing agent without being abrasive, which means it can help you scrub away all the stuck-on food without harming your precious pans. Commercial oven cleaner is probably one of the harshest cleaning products you can buy. But baking soda will get your oven sparkling without all those chemicals. Just sprinkle a thick layer of baking soda over the bottom of your oven and spritz it with water until saturated. Allow the mixture to soak overnight and wipe away the grime the next morning. Sprinkling a little bit of baking soda in the bottom of your kitchen trash can will help neutralize the odors inside, keeping the smell from spreading throughout your home. If you have a plate with sticker residue, create a paste of water and baking soda. Then rub the paste on the sticky area to easily remove the residue. Your luggage can quickly become musty if it isn’t used often. Easily remove the musty smell by sprinkling baking soda inside the suitcase and closing the lid. Allow the baking soda to sit for a few days then vacuum it out for a fresh smelling set of luggage. Water stains can ruin a nice piece of wood furniture. To remove a water stain with baking soda, make a paste with a few drops of water, then rub the paste into the stain. Finish by wiping the baking soda mixture away. If your mattress is smelling less than perfect, sprinkle a little bit of baking soda on top and allow it to sit on the mattress for a few hours. Vacuum the powder up to remove the odors. To make an easy bug remover, mix baking soda with a few drops of liquid dish detergent to form a paste. Rub the paste over your windshield with a wet sponge and scrub the bugs away. Easily clean your toilet with a combination of vinegar and baking soda. Start by pouring one cup of baking soda in the bowl of the toilet. Pour one cup of vinegar into the bowl and allow the mixture to fizz for 10 minutes. Scrub the toilet with a brush to remove stubborn stains. You can easily restore the shine of tarnished silver by following these steps. Start by boiling 2 cups of water, and then add 2 tablespoon baking soda and a pinch of salt along with an aluminum foil. Dip your silverware in water for 15-20 seconds. Take the silver items and dip them in water mixture, then wrap them in another sheet of aluminum foil and keep them in foil for 15-20 seconds. Your tarnished silver items will look like new. Having good oral hygiene is extremely important. To maintain good oral hygiene, it’s important to clean your oral appliances like toothbrush, retainers, and dentures from time to time. So clean them naturally by adding 2 teaspoons of baking soda in a cup of warm water and soak them in it overnight. To easily get rid of stains or cooked food odor from the microwave quickly, add a cup of water in a microwave-safe bowl and mix it with 2 tablespoons of baking soda, put this (uncovered) in the microwave and let it run for 2-3 minutes. The steam from the water and baking soda mixture will deodorize the microwave and also loosen up caked stains inside the microwave. To clean tea and coffee stains using just baking soda dampen the stained surface then sprinkle some sodium bicarbonate and scrub off the stains using a damp cloth. If that does not work, apply a thick paste of baking soda and white vinegar over it and let it sit overnight and scrub it off in the morning. Cleaning your floor without using chemicals is one of the many amazing uses of baking soda. Follow the steps to remove dirt and grime without leaving unwanted marks on your floor. Make a baking soda cleaner and store it in a bottle for use. Here’s how – Mix together 1/2 cup of vinegar, half a cup of baking soda and a tablespoon of hot water. Mix it in water instead of chemical cleaner when required. Easily clean your kid’s creativity on walls using baking soda. Just take baking soda on a slightly wet cloth and rub on the stain. Wipe off with a clean and dry cloth. Make sure you rub lightly or paint will peel off. Take a lemon wedge and sprinkle some baking soda on it. Use this baking soda lemon to easily clean and shine the brass objects. Plastic containers tend to get stained from anything you store in them. However, you can easily remove stains from them using baking soda and warm water. Fill half the container with warm water, add 2-4 tbsp baking soda in it. Let them soak in the mixture for an hour before cleaning. Adding some amount of baking soda to the regular cycle of the dishwasher helps in eliminating unwanted grease from your pans and dishes and also easily remove baked-on food. After a certain time interval, sponges tend to smell like mildew. Baking soda is perfect to remedy to get rid of the smell and freshen up your sponges. Just mix 2 tablespoons of baking soda in half a liter of warm water, then soak the sponges in it for a few hours. This will eliminate the stale smell from overused sponges. If some food turns bad inside the refrigerator, it leaves a foul smell inside it for days. Baking soda can be used to prevent this from happening. How? Just place an opened box of baking soda inside your refrigerator and freezer to help neutralize odors. Baking soda absorbs strong food odor. Replace it every 3-4 months, or sooner if it seems like it is not working anymore. Take a damp sponge and sprinkle baking soda on it. Clean your tile, shower curtains, tub, etc by scrubbing with the sponge containing baking soda. Rinse to reveal shiny surfaces. Of all the smells, urine smell (both cat and dog) are most difficult to tackle. But, you can easily get rid of urine smells of a pet from carpet by using baking soda. Just sprinkle some baking soda on the smelly area of carpet and leave it for 30 minutes, then vacuum up. Easy! Getting rid of food odors like garlic and onion is extremely difficult. The wooden board tends to get smelly fast as wood absorbs smell faster than plastic and ceramic. However, you can easily get rid of the smell by scrubbing chopping board with water and baking soda solution. Are plastic water bottles smelling stale? Just put 2 tsp of baking soda and fill it with water. Leave overnight to get rid of the smell. Rinse well before using again. From Cleaning to Deodorizing, all of the baking soda uses are amazing and affordable. For such a low cost, there are seemingly endless ways of baking soda uses in day to day life. If you found these baking soda hacks helpful, please share them on Pinterest! And if you’re looking for more cleaning tips and tricks, please follow our Cleaning board!